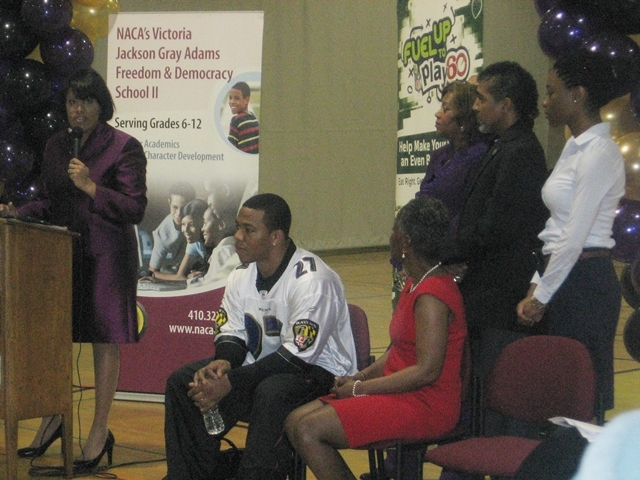 Mayor Stephanie Rawlings-Blake, left, Ray Rice, VP Sonya Gray, Principal Linda Brown, Dr. Cecil Gray, and Ms. Wloeteh Kipi encourage healthy eating and healthy living. Mayor Stephanie Rawlings-Blake made the annoucement on Tuesday, April 12th that she has awarded NACA the grand prize for our participation in the Mayor's Fuel Up to Play 60 Challenge. NACA was one of several schools in Baltimore City to participate in the fitness challenge, hosted in conjunction with the NFL. NACA is honored to have Mayor Rawlings-Blake provide such an opportunity to enhance the lives of our students and their parents with the Fuel up to Play 60 Challenge. We want to thank Ray Rice for his support and for being a role model for fitness.